Façade of Curutchet. House. Photo by C. Zeballos.. The Curutchet House is the only work of Le Corbusier built in Argentina and the Americas (although Le Corbusier designed projects in the U.S. and Chile ). More importantly, this house is a masterpiece of Corbusian architecture, a superb example of the so-called “machine á habiter”, where the experienced Swiss architect superbly solved its form, function, space and lighting, using the elements and paraphernalia which are typical of its prolific theoretical and practical architectural background.. 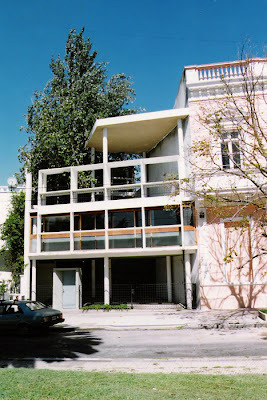 The Curutchet House is open to the public due to its preservation by the Institute of Architects of the Province of Buenos Aires, an institution that uses the house as its headquarters. La Plata is a unique city in South America and one of the best examples of Hygienism of the late nineteenth century on the continent (in this blog were have reviewed other cases of Hygienism in South America: the Plaza de Armas and the Chili River in Arequipa, Peru) . La Plata’s urban layout, based on a gridiron designed by Pedro Benoit in 1880, differs from a typical Latin American colonial checkerboard in its size, the inclusion of several diagonals that cross the urban space and several landscaped tree-lined paths, which in summer cover the streets like green tunnels and in autumn turn the sidewalks into colorful carpets. 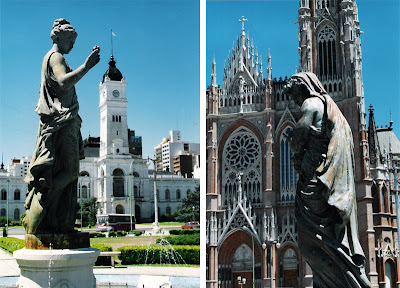 The beauty of its monumental axis and the imposing size of the Moreno Square dialogue with the stature of its neo-Gothic cathedral, made of brick and completed only in 1999. View from the Plaza Moreno, showing the City Hall and the Cathedral. Photo by C. Zeballos . 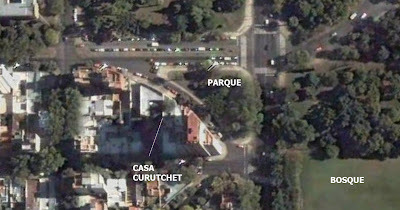 The Curutchet House is located in a residential area of La Plata, in a lot across a small trapezoidal triangular green area, a prelude to a huge park called El Bosque (the Forest). This closeness to nature and the adjacent building volumetric proportions, influenced Le Corbusier, who would consider these aspects to integrate the house to its surroundings. The renowned Argentinian surgeon Pedro Domingo Curutchet wrote to Le Corbusier in 1948 requesting him to make a design for his new house. Curutchet never met Le Corbusier nor the latter visited the site, but the doctor kept a "close affinity” with the architect, whom he considered an innovative intellectual. The program included an office, a house for the doctor, his wife and two daughters, a guest room and facilities. For the construction of the house (1949-53) it was important to involve the renowned Argentinian architect Amancio Williams, who not only proposed changes to the draft of house (which Le Corbusier accepted) but also he was responsible for directing and executing the works. 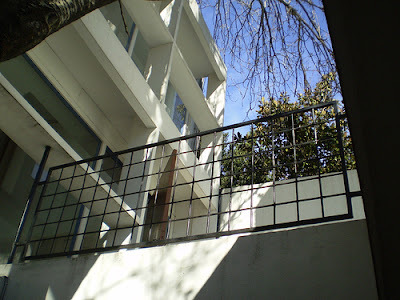 After the death of the doctor, the daughters gave their home in custody to the Colegio de Arquitectos de La Plata. 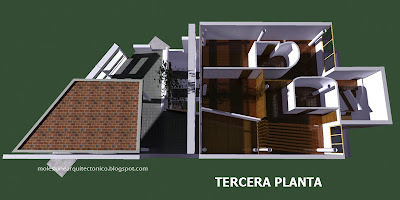 The building is organized around a central space that highlights the presence of a tree, which serves as a virtual boundary between public and private area of the house, differentiating two volumes that allow the function to be clearly distributed and the spaces to be organized under special characteristics. 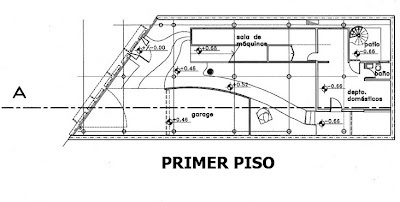 In Argentina the first level is called Ground Floor. The first level is measured from the top to the ground floor. In this blog we have always called "first floor" to the street level, but differences can be found in the available literature. 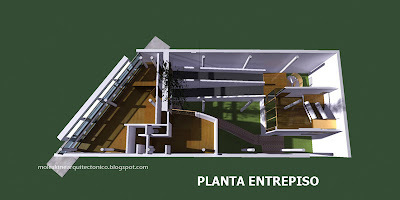 The ramp (which is independent from the stairs leading to residential area) leads to the mezzanine, which is the office. This is basically formed by a waiting area and consultation (the one that has better visuals). The area of internship, located in the back of the consultation, has independent toilets. This is the social area of the house, from which you can access to a wide terrace running the entire width of the lot and from which magnificent views to the park can be enjoyed . To avoid too much solar incidence on the terrace, which would be unbearable in the summer, Le Corbusier suggested the use of a parasol and bris soleil, which, coupled with the tree, provide shade to the space. Integrated into the terrace there are a double-height lounge and a dining room. The functionality of the kitchen, equipped with a service entrance, is unusual for the time in which it was designed. Consists of two bedrooms, each with its own bathroom, the first for the doctor and his wife and the other one for their daughters. Opposite to the master bedroom there is a spatially integrated double-height studio. In the daughters bedroom it is possible to use a system of wooden blinds that controls the entry of light and brings privacy to the room. An analysis of the section allows to appreciate the rich visual and spatial relationships in the house, the way the space is modeled and the use of transparency in order to maximize the feeling of spaciousness in a small plot. 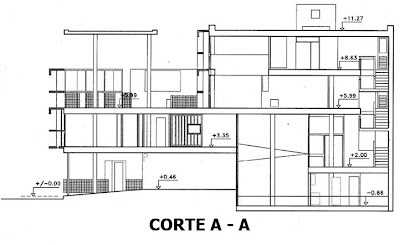 Since the publication of his book Towards an architecture and his writings in L'Esprit Nouveau, Le Corbusier had proposed 5 key principles, characteristic of the new architecture, which were reflected in his most famous house, the Villa Savoye .The Curutchet House is also a good example to understand these five principles of Corbusian architecture. 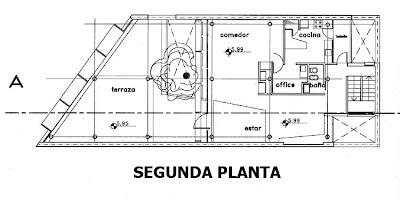 The house is arranged in a grid of columns, independent of the location of the walls, which raise the building from the ground, allowing the use of gardens and patios. 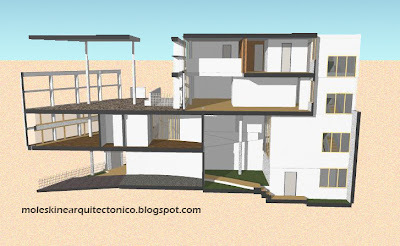 While freeing the walls from the structure, it eliminates the typical bearing walls of old houses, providing great flexibility in layout and interconnection of the spaces. Also a consequence of the independence of the structure, the façade becomes transparent as it is not composed of walls. The use of large windows and ventilation provides natural light to the space. Utilization of the terraces for domestic purposes, among which may include garden areas. As mentioned in previous post , the modulor is a proportional system created by Le Corbusier, based on anthropometric measures and the golden ratio , because he believed that the proportion of the buildings was necessary to express beauty. The architect used this system to design the house elements, distances and the height of the ceiling (Williams had to ask special permission in the city of La Plata to build rooms with a height lower than the regulation). The visual sequence along the route is always offering a new experience of space. At each step, we appreciate the harmonious succession of spaces and the fine use of the light. This spatial arrangement can be perceived, for example, in the course of the ramp, an element created primarily for the exaltation of the internal space. In the words of Dr. Claudio Conenna, "with these elements, Le Corbusier creates dynamic spatial situations, varied perceptions of visuals and perspectives, aside of a consistent transition of scale and lighting in the whole space, with the intention to move (both kinetic and emotionally) to the man who lives the building. " Click here to see a video tour of the house. Le Corbusier has had enormous influence on twentieth-century architectural practice. Notable disciples who worked with him are Oscar Niemeyer and Mario Botta , and his ideas have exerted significant influence on the work of Richard Meier and Tadao Ando . In fact, many aspects of the Corbusian vocabulary are still being used nowadays. He is a master of whom we continue learning today. - OTHER WORKS BY LE CORBUSIER. Hello, i study architecture in France and i want to ask if it's possible to send me the 3D modelisation of this house please ? It's for a work for my studies. Please answer me if it's possible. Prologics, India offers HDR image blending, real estate photo editing and image editing services, image clipping, background removal, photo clipping path service, photo editing, color correction, photo retouching & restoration, clipping path, cropping, resizing services, 3d floor design, 2d floor plan services & many more. Notes on the fly throughout an exciting journey, a logboof of emotions and senses while walking between architectural spaces bathed in light, surrounded by landscape, or being part of it. 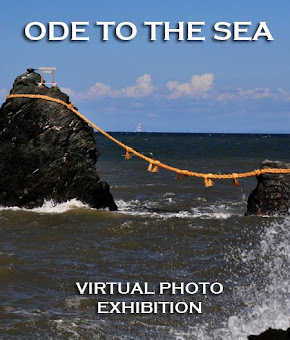 Just like in a moleskine - that notebook where travelers compiled writings and drawings of their visits- this blog offers you, dear reader, my own collection based on my personal experience about interesting sites visited in recent years. "What I hear, I forget; what I read, I remember; what I do, I learn; what I teach, I know." Architect and urban designer, professor in universities in Peru and Russia. Post PhD. researcher on urban design and landscape in Japan. Earned his PhD in Urban Environmental Planning at Kyoto University, Japan and Master degrees in Sustainability in Argentina and Environmental Management in Peru. The texts, graphics and photos, unless otherwise stated, belong to the author of this blog. They may be used for personal and academic purposes, as long as the respective authors and source are acknowledged. Its use is not allowed for commercial purposes.